Supreme Court of Canada: The Supreme Court of Canada, our highest court, is based in Ottawa and consists of nine judges chosen to represent the country’s regions. The Supreme Court has the power to review lower-court rulings on any legal issue but limits its docket to about 100 cases a year that involve issues of national importance. Superior Courts: Each province and territory has two levels of superior court, one to hear trials and the other to hear appeals. Superior courts handle criminal offences, divorces, civil cases involving large amounts of money and Charter challenges, and review the decisions of administrative tribunals and some lower courts. The trial court has various names – it is the Superior Court in Quebec and the Superior Court of Justice in Ontario, but is known as the Court of Queen’s Bench in Alberta, Manitoba, New Brunswick and Saskatchewan, and as the Court of Justice in Nunavut. In all other provinces and territories, it is called the Supreme Court. Rulings made by judges at the trial level can be appealed to the appellate level, either called the Court of Appeal or the Appeal Division, which is the highest court within the province or territory. Judges on each of these courts are eligible to become members of the Canadian Superior Court Judges Association. Judges of the Supreme Court of Canada have declined to join since cases involving judicial organizations like the Association may come before their court. The federal government appoints and pays the superior court judges. Provinces and territories, however, provide courthouses and other facilities and support staff for the trial and appeal divisions of their jurisdiction’s superior court. 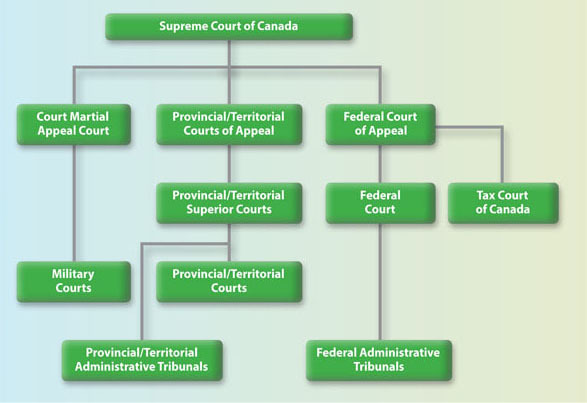 Provincial and Territorial Courts: The provinces and territories appoint and pay judges who serve in the courts that form the lower tier of the court system. These courts have the power to deal with every criminal offence except the most serious offences, such as murder and piracy, and conduct pre-trial hearings, called preliminary hearings, in criminal cases destined for trial in superior court. They also handle violations of provincial laws. In Quebec, this level of court also deals with civil matters involving up to $70,000 and disputes over provincial taxes. Provinces and territories have established Small Claims Courts to resolve civil actions involving small amounts of money. Youth Courts deal with young persons between the ages of 12 and 18 charged with criminal offences.